Statistics is a extremely simple tool that is able to show the number of pageviews in all areas or a single area, ordered by frequency (descending). To open Statistics, please click on the icon to open the Statistics overview. 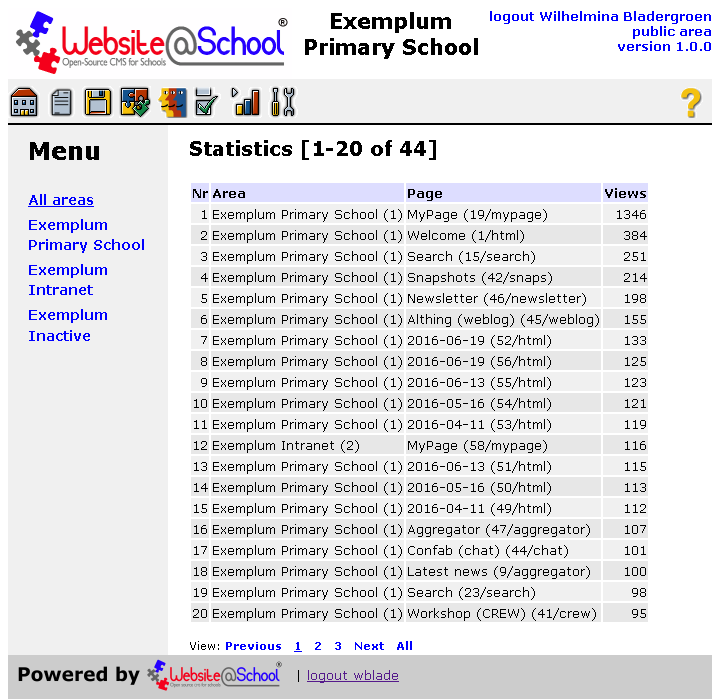 The list of combined pageviews for all areas is displayed. Menu: the menu in the left hand pane shows all available areas which can be selected by clicking the area name. The first option (default) is to show the combined pageviews of all areas. Statistics [nn-nn or nn]: this title conveys which pageviews are currently displayed. Nr: in statistics all pageviews are always numbered from 1 to nnn (in descending pageview order). Area: indicates to which area the pageview belongs. Both the area name and the area number (in parenthesis) are displayed. Page: the name of the page, followed by the page id and the module associated with this page (in parenthesis). Views: the number of pageviews i.e. the number of times this page was requested. Previous nn nn nn Next All: a navigation bar to make it easier to navigate through the (longer) lists of pageviews. If another area is selected from the Menu, only pageviews for that particular area are displayed. 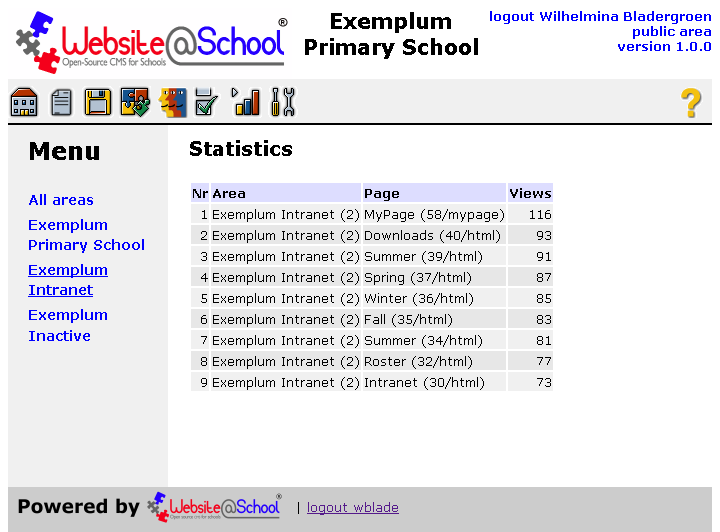 The screenshot below shows the Exemplum Intranet as an example. Note that pagination ([nn-nn of nn]) postfix is gone because the list is smaller than a single page. 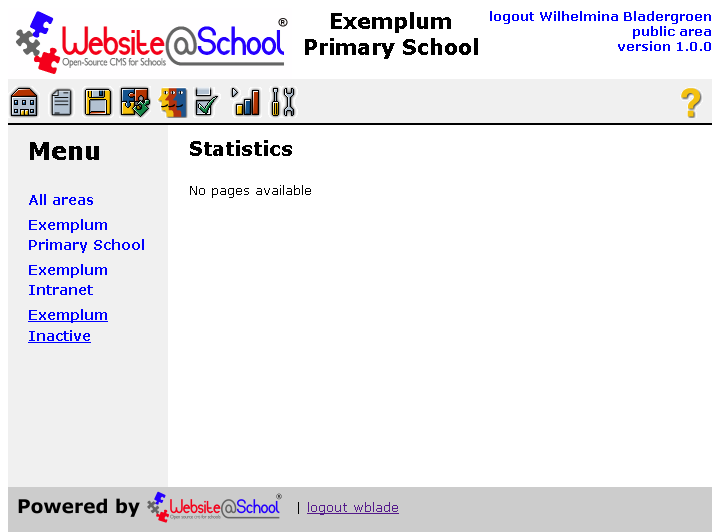 Selecting the Exemplum Inactive area as another example yields the message 'No pages available', indicating that there are currently no pages in that particular area.